The iXdrive self propelled sprayer is designed with big focus on operator comfort and environmental protection. The iXdrive is an 'all in one sprayer' offering ergonomics, efficiency and comfort. The iXdrive offers tank volumes of 4.000, 5.000 and 6.000 litres in combination with the HSS 27-40 metre steel booms (27-30m two-part folded and 32-40m three-part folded) or the HSA 24-30 metre aluminium booms. The cab is spacious, has a good visibility and gives you all the comfort you need. The spraying technology is easy to operate from the cab, as the iXdrive is equipped as standard with the IsoMatch Tellus PRO Terminal and the IsoMatch Grip for easy, simple, fingertip control. iXflow, iXclean Pro: every litre counts! The special HSS profile combines a minimum of weight with maximum strength and stability. The HSS boom range is designed for professional use. It's triangular construction provides perfect integration of the stainless steel spray lines, nozzles and nozzle holders and the optimal hose routing where all is well protected. The HSS boom range consists out of a range of two-part folding (24-30m) and three-part folding (32-40m) spray booms. 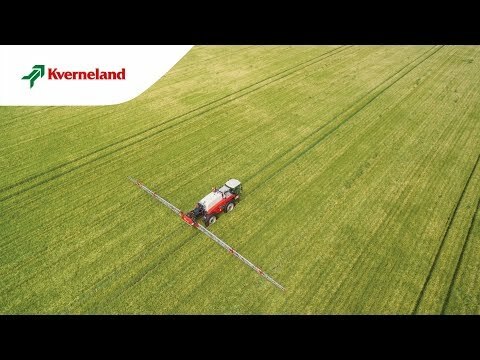 The HSS and HSA spray booms are equipped as standard with the Kverneland iXflow spray line recirculation system with pneumatic nozzle control. The EasySet control panel is located, between the wheels, at the left hand side of the iXdrive. This position close to the tank outlet results in an extreme low rest residue. It makes life easy by its intuitive operation. The control panel includes the electrical valves (iXclean Pro), pumps, filters, chemical inductor and the hose connections. So everything you need for filling and emptying the tank together on one place. The control panel is well protected behind a cover; this keeps your operational area free of dirt and chemicals. The valve panel can fold away for easy access to the pump and for maintenance. The chemical inductor with a capacity of 42 litres allows you to mix chemicals safely. Equipped with a circular rinsing system and a waterproof cover, it can be rinsed safely with the cover closed. The silent diaphragm pump with a capacity of 500 litres ensures quick tank filling. The iXdrive is equipped as standard with iXclean Pro our fully automatic electric valve management system. It means all functions can be controlled from the cab or the fill station. Switching between filling, agitation, spraying, diluting, priming, rinsing and tank cleaning is extremely easy: just push the button! iXclean Pro also offers a fully automatic multi-step rinsing and cleaning program again at the push of a button! It just takes a few minutes and residue levels are after automated cleaning below 1%. For optimal protection of the crop the iXdrive is available in three different ground clearance and track width combinations. For the iXdrive 4240-5240-6240 is a ground clearance of 1.3m, 1.5m or 1.7m and a track width of 1.8-2.25m or 2.25-2.95m possible. For the iXdrive 4180 there is a ground clearance of 1.2m, 1.4m or 1.7m and a track width of 1.5-1.8m, 1.5-2.25m or 2.25-2.95m possible. The hydraulically adjustable track width ensures optimal row spacing possibilities in different crops. Adjustment between the two track widths from the cab is available as an option. The hydro pneumatic suspension on both axles provides operator comfort and boom stability in transport and field operation. The 3D rear axle suspension allows axle movement, but limits the track influence on the spray boom. The strong chassis with an optimal gravity point brings a perfect 50%-50% weight balance in every situation, without any influence from tank filling or spray boom position. Manoeuvrability is guaranteed with 2-wheel, 4-wheel and crab steering modes as well as ErgoDrive headland control management as standard.